In November 1976, a group of men in the Charlottesville-Albemarle area decided to form a volunteer fire department on the north side of Charlottesville; an area which was lacking in fire protection. After a series of public hearings, approximately forty people gathered together to form the Seminole Trail Volunteer Fire Department. After conducting monthly meetings and extensive fire training, the Seminole Trail Volunteer Fire Department became operational on November 8, 1977 with one engine (E-81) and forty-three active members, covering the Route 29 corridor from Interstate 64 to the Rivanna Reservoir. The engine was housed in a maintenance garage for Oakwood Mobile Home Sales owned by Walt Buckrim. The Buckrims allowed Seminole Trail the use of the garage space for free until we were able to construct our current station. Weekly bingo games were held on Saturday nights at Woodbrook Elementary School to raise funds for the fledgling department. By 1980, we had acquired a second fire engine (E-82) and moved into our new fire station at present location (3055 Berkmar Drive). In 1983, after acquiring our third engine (E-83), we enlarged the station to include a kitchen and a large community room. Our weekly bingo games were now moved to the station community room. This fundraising effort over the years accelerated our ability to pay off our station and purchase new apparatus. Four years later, in 1987, we began our First Responder program adding Emergency Medical Assistance to our services. In 1989 and 1993 we purchased new Pierce Class-A engines (E-84 & E-82 respectively). In early 1998, at the request of the Seminole Trail VFD Board of Directors and brigade membership, the county of Albemarle hired its first paid firefighters to staff the station during the weekdays. In July of 1998, Seminole Trail took delivery of a new 100 foot Pierce platform ladder truck purchased by Albemarle County. Our next purchase, Engine 85 is a 2000 Pierce rescue engine, went in service March of 2000 and runs car fires, car accidents, brush fires, medical calls, and extrications. Just prior to this purchase, STVFD had just become debt free having paid for the fire station and all the existing apparatus. A few years later bingo was discontinued as the revenues were beginning to dwindle and the community hall space was needed to expand our living quarters. By dividing up the community room, two new 6 bed bunk rooms were added along with two additional bathrooms with showers which tripled our capacity. Prior to this renovation, many FF’s spent the night sleeping on roll-away beds moved into the open community room each night. Our newest piece of apparatus, Engine 81, was placed in service on March 30th 2008 at our housing ceremony. Engine 81 is a 2008 Pierce Dash with CAFS and a full compliment of rescue equipment. In the early years Seminole Trail had nightly duty crews that covered the station from 6pm to 11pm. Members responded from their homes to the station at night to get apparatus and respond to calls. During the day members left their jobs to respond to calls, mainly from Sperry Marine Systems. In the mid-eighties there was a transition to members spending the night at the station and soon duty crews were developed to share the load across most of the membership. This transition continued to evolve and currently volunteers staff an engine company and the tower ladder every night, all weekends, and holidays. Albermale county career staff assist with covering weekdays from 6am to 6pm. This combination approach keeps the Seminole Trail Volunteer Fire Department staffed round the clock, 365 days a year. During our first year of operation in 1978, we answered 166 calls. Since then, the number of calls we run has increased to over 2,400 in 2006 making us one of the busiest volunteer fire departments in the state of Virginia. In the fall of 2013 we began our fire station expansion/renovation project. During this project the fire brigade moved into the adjacent building that was formerly the Charlottesville-Albemarle Rescue Squad Berkmar Station. 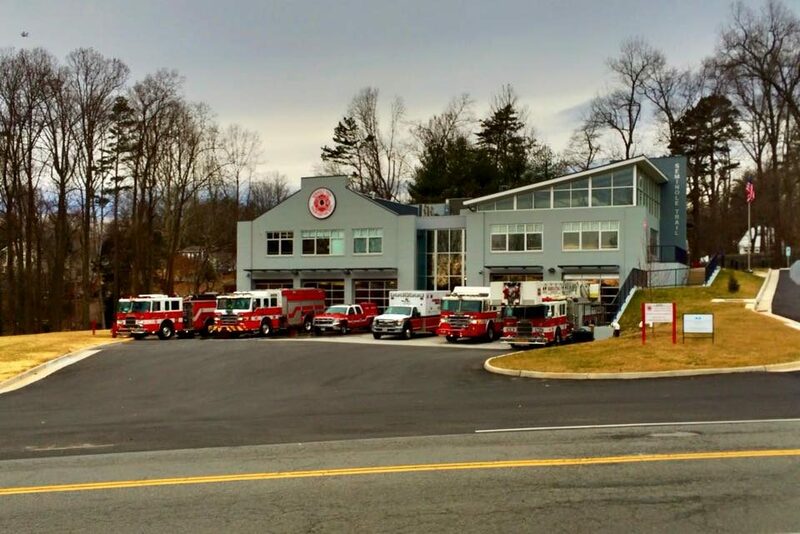 In the fall of 2014, we were able to move back into our new station. The Grand Opening Ceremony was held on November 23, 2014.